Today, there is a pressing need for a new, more comprehensive and relevant perception of human economy as a whole in order to understand the prerequisites for sustainable livelihood for the whole of the humanity and to be able to create a lifestyle which could provide a dignified quality of life for all people, with due respect to the ecological boundaries of the biosphere. The new perspective is also needed as the counterforce in the hands of people against the overriding market globalization, which is intimidating the democratic power, i.e. the traditional channels of people to influence in their society and economy. We are seeking the people’s power to control the market and to have their economy in their own hands. The concept of human economy is used in this paper to signify all work, production, actions and transactions needed to provide for the livelihood, welfare and survival of people and families, irrespective of whether they appear in statistics or are counted in monetary terms. Here we see the human economy as composed of three major, distinct components, which are the household economy and the cultivation economy in addition to the industrial economy. In fact, households and cultivation have always existed, long before money and industry were ever invented, but they are still invisible in the eyes of mainstream neoliberal economists. - the cultivation economy, i.e. the production based on the living potential of nature, which is the interface between economy and ecology, human culture facing the ecological laws. Both of these economies are very basic from the point of view of a sustainable way of living, and thus for human survival and people's ability to control their own lives. A particular feature of the households is the extent and significance of nonmarket work of people without pay for direct production of human welfare, and thus as an essential contribution to satisfy the basic needs. A particularity of the cultivation economy is its profoundly unique nature by being based on potential of living nature. As we know, the human abilities cannot control and direct the elements of nature; therefore the humanity should be wise enough for taking the terms of nature seriously into consideration. Households, Cultivation and Industry and trade are the basic pillars of the human economy. Each one of these components has different foundations and terms of operations. This has to be taken into consideration in the agency of human economy in order to achieve sustainable exchange and collaboration between all three. In founding of economics the processes in cultivation and unpaid work and production in the households have both been left out of the realm of economic science. Therefore it is obvious that this kind of economics is only a narrow part of human economy as a whole. However, during these couple of hundred years this narrow philosophy of economics has become the only theory and language of economists, by way of which the value of production and work, exchange and spending is assessed and measured. 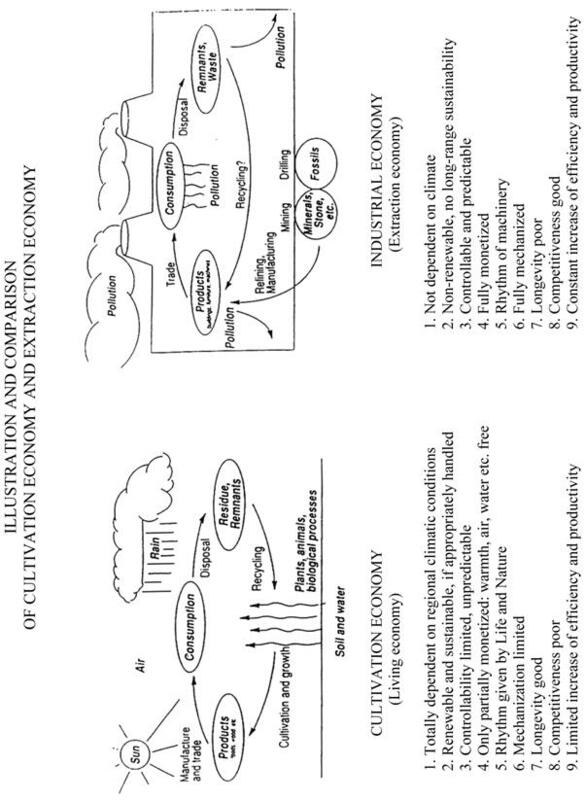 Figure 2. illustrates the great and essential differences between Cultivation economy and Industrial economy. The industrial economy can also be called Extraction economy, since it is based on dead elements extracted from the soil; stone, minerals and fossil fuels. It also deal only with dead transaction like trade, traffic, currencies and accounts and its value is measured by money, which is a nonmaterial fiction. In human history after the transition from the gathering economy to the cultivation economy the extended farming family has been the basic unit of livelihood for long periods. Along the time the people’s skills and means developed to enable qualitatively better satisfaction of their basic needs. This kind of “a house-hold” (note: holding the house/farm) was fairly independent and self-reliant economic unit at the modest level. The livelihood was based on the quality and accessibility of natural resources and skills and assiduity of the people living together. During the course of centuries various kinds of production and trade, independent artisania, exchange of goods and services, public institutions and administration were emerging around the farming families. The public society and economy was in the making. A means of exchange came into the picture, and people started to buy and sell goods and services. When the basic functions for livelihood are performed within families, they cost a lot of time and work, but when externalized into the public sphere, they will cost money. In this process many of the traditional vital functions were substituted with commercial ones. Thus they became dispensable and therefore the status of women as providers was declining. A major part of economic growth in the past centuries has consisted of the functions being transferred from the private family to the public one, from the non-monetary economy to the monetary one and thus been made visible and counted. This way the life and production also has become monetized and commercialized. From women's point of view this discussion is very important. The non-monetary economy even in the industrializing countries has until lately been primarily a female economy. Its invisibility is a supreme manifestation of women's invisibility in the society at large. Today the family economy is still primarily in the hands of women even in its monetized form, the consumption of marketed goods and services, since the purchasing decisions are made primarily by women. In the emergence of the public, monetarized economy, production, politics, culture and organization outside the private family, all this was designed, planned and built up exclusively by men, who possessed neither the particular gifts nor the experience of women acquired over centuries in the management of the private family and nurturing its members. that the long-term imbalance between male and female rate of influence in planning and conduct of modern industrial societies is the virtual source of most of social, economic, human and international problems which we face today. In Finland the time-use surveys on unpaid housework has been made very thoroughly in 1980, 1990 and the latest in 2001. The time spent in unpaid labour in average Finnish families is presented in Figure 1. The share of women has been about 60 % of the total in 1990 and 2001. The distribution of unpaid work between men and women varies a lot between the families as well as between the countries. But statistically there is hardly any change taken place between 1990 and 2001. In these studies in Finland all the unpaid work in the households is counted, i.e. the work of women and men, boys and girls. The interesting point is that the time used in the non-market work in the households has not much decreased, although one might assume that the purchasing of services and goods from the market would have increased along the years. The monetary value of unpaid work has also been calculated and the measuring rod has been either the average wages in the labour market for all employees or the current salary of municipal home helpers. They give somewhat different figures, but the first one is more relevant, since the housework requires several skills and competences. When compared with the GNP of same years the proportions in Finland are in Table 2 and they correspond well with the average of international statistics. (Varjonen – Aalto, 2006). The percentages given imply that the amount of unpaid labour in the households would be the highest single contribution into the GNP if it were counted. In comparison with the state budgets the value of unpaid work is usually about two times the sum total of the same year’s state budget. The UNDP/Human Development Report 1995 gives even a global estimate of the amount of women's unpaid labour. "If more human activities were seen as market transactions at the prevailing wages, they would yield gigantically large monetary valuations. A rough order of magnitude comes to a staggering 16 trillion (dollars) - or (if added, it would make a total of) about 70 % more than the officially estimated 23 trillion of global output. Of this 16 trillion, 11 trillion is the non-monetized, invisible contribution of women." "Of the total burden of work, women carry on average 53 % in developing countries and 51% in industrial countries." Out of the total time of women's work, 1/3 is paid and 2/3 unpaid. For men it is just the reverse, 3/4 of their working time is paid and only 1/4 is unpaid. "If women's unpaid work were properly valued, it is quite possible that women would emerge in most societies as the major breadwinners," concludes the HD report (UNDP, 1995). "For the last fifty years national income statistics have been widely used for monitoring economic developments, for designing economic and social policies and for evaluating the outcomes of those policies. Had household production been included in the system of macro-economic accounts, governments would have had quite a different picture of economic development and may well have implemented quite different economic and social policies," concludes the OECD researcher Ann Chadeau, who has done extensive work on this issue (1992). - on one hand it will aim to the total abolition of work and skills in the households, in the private life of people, since all labour and skills are absorbed into the market. - on the other hand people are supposed to acquire professional competence only in one single field, where they will then earn money enough to buy everything else in life from the market. The time people spend outside the economic system is reduced to pure unskilled leisure-time. This way the living households would cease to exist, the people will become totally dependent on market and the home remains only as a place to sleep. This would legitimate the continuity of the market forever, render people market slaves and annihilate the human dignity of everybody. This is the ultimate ideology of the market (Cogoy 1995). If market forces are allowed to pursue these aims to the ultimate, it will imply that people will find themselves helpless and powerless pawns in their society, unable neither to command their own life nor to influence their society. The economics has never taken human beings as dignified individuals but only as means of production and consumption, as fuel to keeping the system running. However, the household is still the area of the economy where people do have power in this world, where they find very few options to influence macro economic issues. The choice to decide how much one would like to produce by her/himself and how much to buy from the market is exactly the leverage of power still in the hands of individuals. It is crucial to everyone’s own personal independence and integrity in life, whether she/he keeps this power in her/his own hands or lets it vanish away. The “ideology” of the households is contrary to the one of the market. The human being and her wellbeing is the point of departure for the household, her dignity and integrity are its basic values. According to the household-ideology all work and production is for people, to serve their needs and aspirations, physical, mental and spiritual. We saw above that households and women have critical position in the human economy, therefore we can draw the conclusion, that they also could turn the trend. They can change the values and lifestyle in families back to the basics, less consumption of the market goods and services, more emphases on commonality, working together, making family life self-servicing, achieving pleasure and satisfaction by being and doing instead of buying and paying. every individual is indispensable and dignified member of the family and community, and we are all subjects in our own life, not objects of anonymous market forces. 5. Turning the trap into an asset - the Utopia for good life? At that time Robert Jungk referred to the unemployed people being more or less permanently without paid jobs. Today we may apply this thought also to the people who have paid job only temporarily or occasionally. These people are in the trap of constant job-seeking and they find themselves forced to accept almost any kind of work on any salary. However, the thought of Robert Jungk gives some hope that we could – and we should – stop the rat race and turn around the wheel. We should not let the lack of a regular job to render us paralyzed and hopeless. We can realize that this situation will allow us to command more of our time, and the scarce income could become an incentive for us to make more use of our skills, knowledge and experience in our own households. These thoughts could be a hint for finding one’s own creativity and initiative. While finding her/his own skills for helping oneself will lead better control of one’s own life, too! How would it feel like, if we make our own plans for our household economy and decide to do more at home in order to decrease our dependence on the money-income and supply of the markets? Then we will realize that the more of necessary goods and services we are able to produce by ourselves, the less we are dependent on the market, both on labour market and the market of goods and services. Would this become a strategy to use power from below to influence the economy around us, too? This kind of an economic transition will make the household again an asset in the hands of people. A decisive prerequisite for making these changes possible is the multiplicity of practical skills, which we can acquire for instance from elderly relatives, the advisory books or various training lessons and courses – if we have never learned them or forgotten them. However, we should not allow this change to increase the workload of women in the house again. Therefore it is necessary to equalize the distribution of labour between women and men, girls and boys, at home. Even for the sake of men themselves it would be necessary to design a new division of labour in the house. When men can no longer be the single breadwinners anyway, they could become direct supporters of their families in practice and it will give them a meaningful and rewarding new role in the family. Within the younger families in the Nordic countries we already have good signs of this kind of transition. The richer the family is in the practical skills of its members, the better chances they have together to decide their relationships- if it were counted. Together with the monetary contribution of households as consumer units these contributions make an enormous “hidden market force” or potential leverage of power in our hands. It is real people’s power from below over the neoliberal macro economy globally. Today the globalized capitalist market forces have become a new “totalitarian super power”, which has rendered our democratically elected governments and political institutions fairly powerless. And the more representative democracy is intimidated, the more we need a new kind of people’s power from below. To summarize I would like conclude that as individuals we can reassume our right to decide ourselves, how much of our work, time, skills and know-how we are willing to sell to the labour market and how much goods and services we are willing to buy from the commodity market. This would be the way to regulate our degree of dependence on the market. The pivotal assets are skills and money, but the skills are more important than money. the industrial and commercial economy should be seen only as auxiliary, serving the needs of families and individuals instead of using them as means of production and consumption. This turn around of the economy will never be made by the market, nor by our democratic governments any more in today’s world. In the globalizing world we have to do it by ourselves, to take the power back in our own hands to command our own lives. For that purpose we have to denounce the values and rules on which the neoliberal economy operates, such as constant economic growth, conspicuous consumption, maximization of profits and competition by everybody against everybody in everything and everywhere. If we stop obeying the signals of marketing, advertising, fachions of all kinds etc. the expansion of the market will stop. We can stop consuming more than we need. We can start saving instead of consuming - not only money but the climate, natural resources, goods, our time etc. We can cooperate and serve others instead of competing, Not to believe, obey and go along with the market will be the end of market-slavery and the beginning of our new liberation. The really powerful choice is to buy or not to buy - to reject all advertising, fashions, marketing and other manipulation and decide independently by ourselves, what we need and what we don’t need. People’s power is always acts of individuals, democracy is the power of millions of individuals acting together in the society at large. This will be the democracy in the age of globalized market hegemony. with both the labour and commodity markets. And the richer the village, community or local cooperative is in skilful and multitalented people, the less dependent they are on the goods and services provided by the market. Furthermore, gaining more control on their own economy they will also gain insight to influence the economy of their society. 6. Democracy in the age of globalizing power? - if it were counted. Together with the monetary contribution of households as consumer units these contributions make an enormous “hidden market force” or potential leverage of power in our hands. It is real people’s power from below over the neoliberal macro economy globally. People’s power is always acts of individuals, democracy is the power of millions of individuals acting together in the society at large. This will be the democracy in the age of globalized market hegemony. Excerpt of a long paper. - the "global substitute" method, whereby a general housekeeper's wage rate on the market is taken as a substitute value for all unpaid housework, which rests on the assumption that housework does not require any particular qualifications. Therefore also the average wage in the labour market is used within this method. - the "specialist substitute" (also called “the replacement cost”) method, which relates various types of household tasks to the wage levels for the type of work performed by professionals such as cooks, nurses, gardeners etc. All these ways of measurement are applying the so called input-based method, because they measure the household production through the inputs to the process as the working hours. - the “output-based evaluation” implies the valuation of the non-market production in terms of the market value of the outputs produced, whereby the products and services produced in the household are assigned a value equivalent to the price of similar market goods and services (such as the meals served in the restaurant, the cleaning performed by a professional firm, etc). Output-based evaluation method does not require time-use data, but data about the amount of goods and services produced in the households and their values in the market. Chadeau, Ann. (1992). What is Households' Non-market Production Worth? OECD Economic Studies No.18, Spring 1992. Cogoy, Mario. (1995). “Market and non-market determinants of private consumption and .their impacts on the environment”. Ecological Economics 13 (1995) 169-180. EUROSTAT, Statistical Office of the European Communities. (1998). Proposal for a Satellite Account of Household Production. DOC E2/TUS/4/98. Housework Study. (1981). Part 8. Official Statistics of Finland XXXII:79. INSTRAW. (1995). Measurement and valuation of unpaid contribution: accounting through time and output. Santo Domingo. Jungk, Robert. (1983). Under Conditions of Humanquake. An interview in IFDA Dossier 34, March/April 1983. OECD. (1995). Household Production in OECD Countries. Data Sources and Measurement Methods. Paris. Olin, Ulla. (1975). “A case for Women as Co-managers. The Family as a General Model of Human Social Organization and its Implications for Women's Role in Public Life.” In: Tinker, Irene and Bo Bramsen, Michele (Eds. ), Women and World Development. Washington l979. Overseas Development Council. Pietilä, Hilkka. (1990 b). “The Daughters of Earth: Women's culture as a basis for sustainable development”. In: Engel, J.R. & Gibb Engel, Joan (ed. ): Ethics of Environment and Development. London/Belhaven Press. Pietilä, Hilkka. (1997). “The triangle of the human economy: household - cultivation - industrial production. An attempt at making visible the human economy in toto.” Ecological Economics, The Journal of the International Society for Ecological Economics, 20 No 2 (1997) 113-127. System of National Accounts, 1993. EUROSTAT, IMF, OECD, UN, World Bank. UNDP. (1995). Human Development Report, 1995. New York, Oxford/Oxford University Press,. United Nations. (1996). Platform for Action and the Beijing Declaration, Fourth World Conference on Women, 4-15 September 1995, Beijing, China. UN/DPI, New York.